The International Civil Aviation Organization believes that air navigation services over Crimea and its territorial waters should be provided by Russia, while Ukraine should be in charge of the open sea. In the conflict between Moscow and Kiev for control over airspace over Crimea, the International Civil Aviation Organization (ICAO) has taken Russia's side. According to the Kommersant national daily, which cited the Russian Transport Ministry, the ICAO has recognized Crimea as part of Russia. The decision was taken following talks between Russian Deputy Transport Minister Valery Okulov and ICAO Secretary General Raymond Benjamin. The relevant requirements will be incorporated in a tripartite agreement between Russia, Ukraine and the ICAO. In the organization's opinion, air navigation services over Crimea and its territorial waters should be provided by Russia, while Ukraine should be in charge of the open sea. "It should be borne in mind that the ICAO deals not with politics, sovereignty and territorial integrity of states but with air safety. That is why the discussion was not only about Russia's right to provide air navigation services over Crimea and territorial waters," explains Alexander Mikhailenko, professor at the Russian foreign policy department at the Russian Academy of National Economy and Civil Service. However, Mikhailenko adds, a mere two months ago that was impossible. "Today it is already clear that Ukrainian air navigation services will not be operating in Crimea, hence this decision, since demand for international flights and the provision of safety is high.” He added that in his opinion Turkish airlines would be the first to react to the ruling, with others following suit. However, he warned that the U.S. and its allies may try to hinder this process with bans, sanctions and other means. Moscow and Kiev have been unable to agree on which country Crimean airspace should belong to since Ukraine was forced to cede control of the peninsula. In mid-March 2014, Ukrainian air traffic control services closed the airports in Simferopol and Sevastopol aas well as lower airspace over Crimea "until further notice". As a result, Eurocontrol (European Organization for the Safety of Air Navigation) banned European airlines from flying to any airports in Crimea or passing through the region. Previously, flights to Crimea were operated by Turkish Airlines, AtlasJet, WizzAir, Austrian Airlines, and Air Baltic. At the moment, however, flights to the peninsula are made only by 15 Russian airlines, which have replaced foreign carriers. 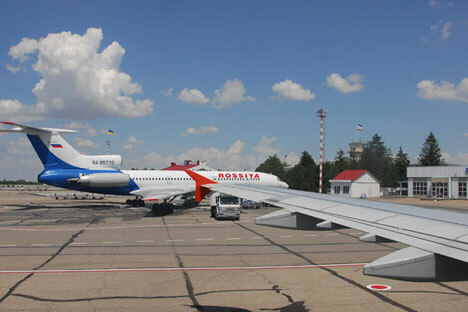 According to the Russian Federal Air Transport Agency (Rosaviatsia), Russian airlines carried some 296,000 people to and from Crimea in June, nearly 3.7 times the figure for June 2013. "Crimea continues to be affected by legal uncertainty in many areas, including those to do with air travel,” says Vasily Ukharsky, a macroeconomic analyst with UFS IC. “The desire by the International Civil Aviation Organization to bring some clarity and resume international flights to Crimea is, of course, a good sign, since at present only Russian airlines operate flights to the peninsula, while European air carriers are subjected to a ban by the European Organization for the Safety of Air Navigation," he said. The ban was a political decision, he adds, as a result of which the ordinary residents of Crimea are affected. The ICAO's decision may change everything, however. "The ICAO has recognized that Crimea belongs to Russia, but not in the political sense, only within its narrow remit: air safety. One can expect that the ICAO will soon be followed by other international organizations in their specialist fields," says Alexander Mikhailenko. On the other hand, Crimea may then be recognized as part of Russia politically by international organizations in charge of ensuring peace and security, for instance the UN or the OSCE. For his part, Vasily Ukharsky says it is too early to be speaking of foreign airlines returning to Crimea and of the transport blockade of the peninsula being lifted, but if that does happen, it would be a considerable step towards bringing life on the peninsula back to normal. In particular, it would mean that the transport blockade of the peninsula has failed. Earlier, the ICAO introduced similar bans on transport hubs in other territories not recognized by the international community, namely Sukhumi airport in Abkhazia and Ercan airport in North Cyprus.